Late 18th- or early 19th-century gilt-tooled diced Russia. Fürstlich Liechtensteinsche Fideikommissbibliothek, Vienna; Dr. Silvain S. Brunschwig; his sale, Geneva, Nicolas Rauch, Mar. 29, 1955, lot 295; purchased there by Arthur Rau, Paris for William S. Glazier (1907-1962), New York; deposited in the Pierpont Morgan Library by the Trustees of the William S. Glazier Collection in 1963. Ms. written and illuminated in Belgium, possibly Tournai, ca. 1390. 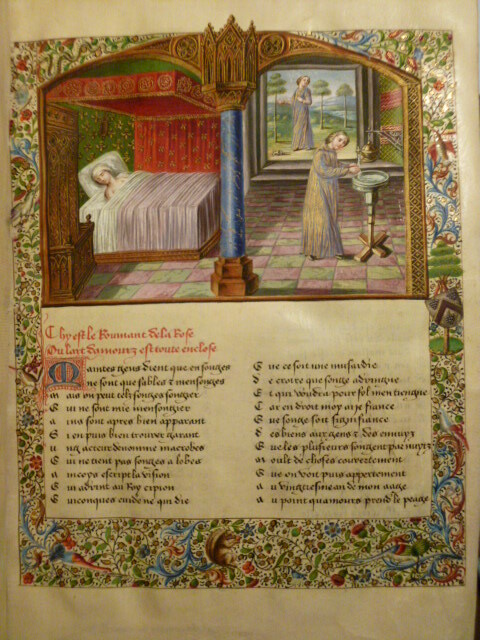 Texts: Roman de la Rose, begun by Guillaume de Lorris and finished by Jean de Meun (fols. 1-143) with interpolations of Gui de Mori. Includes a paraphrase of the Pater Noster (fol. 143v) and the "Testament" of Jean de Meun (fols. 144-169). Decoration: 2 large miniatures, 90 small miniatures (1 large and 85 small original miniatures, some retouched; 1 large and 5 small modern miniatures on fol. 1, 2, and 2v), full modern border with Budé arms on fol. 1r.